The Virginia Packet Network (VAPN) is the brainchild of several amateur radio operators in the northern Virginia area who share a view that packet radio still has a role to play in the enjoyment and utility of amateur radio. This view includes learning lessons from the previous downfall of packet radio while exploring new paradigms. Where once the extensive packet radio node empire provided Internet like sharing of data and content, this role is now firmly in the realm of the actual Internet. This leaves packet radio with much less to do. It can now focus on facilitating back-to-basic messaging and chat between operators. New techniques are emerging in the digital landscape including the 802.11 MeshNet folks and impressive voice channel digital modes by FLDigi and the NBEMS concepts. Competition is a good thing and it’s important to see where packet fits in this new digital landscape. PSK31 [+ icon] – shown simply as a 31.25 bps reference at 160 – 6m. 8-PSK500F and 8-PSK2000F [Triangle icons w/o bars] – New modes from the continuing and impressive work from the FLDigi developers. Like HF and 1200 packet, these modes fit into the bandwidth of a voice grade radio link. Combined with NBEMS these phenomenal new PSK modes challenge the AX.25 packet based message concepts. Freewave [diamond icon with bar] – This is an example of a 915 MHz FHSS serial modem made by Freewave Technologies. Personal experience confirms exceptional performance. While not specifically an amateur radio product, the 902-928 MHz ISM band may be used under Part 97 making industrial radios a valid option in the digital radio landscape. 802.11 Networks [triangle icons with bars] – The HSMM-MESH and AREDN efforts represent a real leap forward in data movement. Many non-amateur efforts exist as well in the Part 15 regime. A significant advantage of these 802.11 efforts is use of the Internet Protocol thereby leveraging all known Internet applications. Greatly increased data rates are alluring as well. Time will tell if Part 97 or part 15 reigns supreme in the ongoing development. Security and legality concerns aside, the VAPN community can benefit by provisioning a telnet port to the BBS/Chat node on the nearest Mesh network. An AX.25 BBS/Chat capable node is one of the few applications that can service nearly any band from DC to daylight with a consistent, centralized and well known interface. 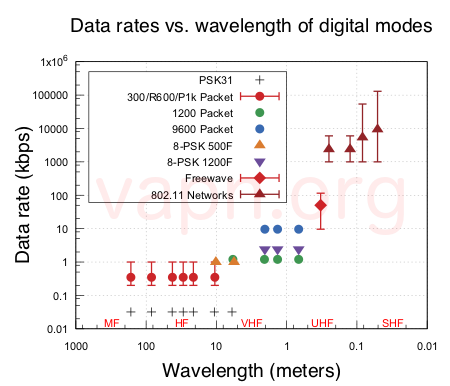 One thing is abundantly clear about figure 1, in the middle ground VHF and UHF bands, 9600 packet is no longer a luxury, but a necessity if AX.25 is to keep pace with competing developments. 9600 packet combined with HF packet frequencies and maybe a telnet port on a Mesh network provides the user a broad palette of choices for message movement. Frequency diversity is a key feature of the VAPN. Packet radio still exists in and around Virginia, but the various systems have the same basic topology from packet radio’s inception in the 1980s. As many will recall, the interconnection of the many nodes on few frequencies helped packet radio crush itself under its own weight as AX.25 tried to cope with increasing traffic. With the need for interconnection largely overcome by industry’s great achievements in commercial services (Internet, cellular, etc. ), one can make the case to simplify packet systems to a single node machine. Adding more ports on a variety of bands provides a form of frequency diversity that capitalizes on the different propagation characteristics. Examination of other local and regional packet systems suggests this approach is one common attribute of the surviving systems. The likely location of the VAPN system will serve Fauquier County and surrounding areas. Initial talks about a good hilltop location are complete. HF ports will hopefully provide coverage of large portions of Virginia at certain times of the day. This includes a long segment of the Appalachian Trail with its small cadre of licensed operators plus many of the campsites along the blue ridge mountains. Our vision is to accurately create an effective packet network to allow VAPN to endeavor to reliably deliver user-centric messages of value. Port-frequency diversity, node system placed with the radios on a hill with a view of DC, the AT and points south make for a useful message management system. The fundamental and primary goal of the VAPN is to leverage the propagation advantages of our amateur radio bands towards reliable delivery of messages. The goal is not to replicate or compete with commercial data services. Time will tell if amateurs take note and avail themselves of the packet radio services.